The process of TCO certification can follow several different paths. 1. Certification following a training course with a training partner. An individual student takes a training course with one of our training partners. 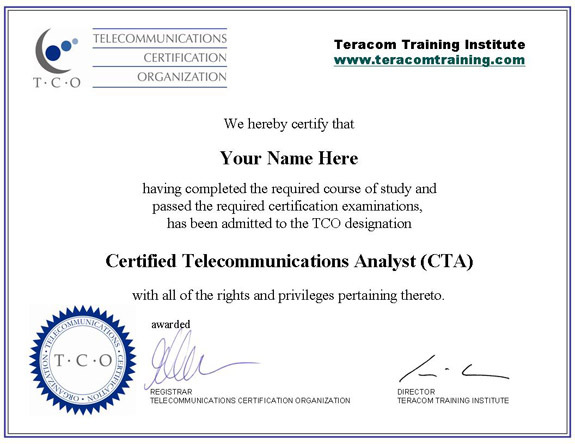 The cost of the relevant TCO certification is included in the tuition paid for the training course. On completion of the course, the student takes the TCO certification exam administered by TCO and with a passing grade is awarded a certificate. 2. Before-and-after testing for a group of employees. An employer contracts with one of our training partners for a private onsite telecommunications training course. The cost of testing and certification is included in the fees paid for the training course. Before the course, each student is invited to take the certification exam. After the course, each student is invited to take the certification exam again. The set of questions is not identical from one session to the next. A management report showing before- and after-training results for each student and overall group results is provided, along with certificates for the students. 3. Certification not following a training course. An individual who believes that they possess the knowledge appropriate to a certification level takes a certification exam only from one of our training partners, and with a passing grade is awarded a certificate. This certification is independent of any particular training course or training company.